This month Koro Sun Resort announces the opening of their brand new Edgewater Bures. Situated at the southernmost point of this authentic, beautiful, and highly regarded Fiji Resort, the new waterfront bures are the ideal spot for a romantic getaway, whether for a honeymoon, an anniversary, or the island vacation of a lifetime. Fiji has long been a coveted honeymoon destination. The warm, crystal-clear waters, lush rainforests, temperate weather, unspoiled beaches, and unhurried way of life all add up to fertile ground for the blossoming of romance. It’s obvious why so many couples choose Fiji as the destination of choice for their romantic getaways. And, of all of the resorts in the Fijian Islands, Savusavu’s Koro Sun Resort must be a serious contender for the title of “most romantic.” This 160-acre hideaway is a nature-loving romantic’s paradise. Set on a coconut plantation within a private lagoon, Koro Sun offers visitors a deluxe, relaxing “home away from home,” and the chance to experience authentic Fijian culture in the remote island of Vanua Levu’s secluded villages. The Koro Sun resort has been getting a lot of media attention lately. This Fiji Honeymoon Destination was featured on the hit NBC reality series, The Bachelorette, and Brides Magazine, Islands Magazine, The Los Angeles Times, and The Sydney Morning Herald have all given this romantic hideaway rave reviews. Koro Sun’s Edgewater Villas are always in demand among honeymooners and those treating the family to an exotic vacation. These waterfront villas are situated partially over the pure, crystalline waters of the Koro Bay Lagoon, and feature private gardens, swimming pools, and sundecks. The master suites on each of the villa’s upper floors offer guests a spacious and luxurious feel: with king-sized beds, leather lounges, and private rooftop viewing decks. The lower levels have all of the comforts of home, plus glass portholes in the floor for observing ocean life, and ocean access is provided with your own deck and ladder into Koro Sea. On November 1st, 2013, Koro Sun opens 10 new Edgewater Bures that are located at the southernmost point of this picturesque Fiji all-inclusive resort. The waterfront bures represent the picture-perfect romantic island getaway for travelers of any kind. Their authentic, Fijian-style thatched roofs, elevated, secluded porches, and private beaches will charm all guests staying in the bures. 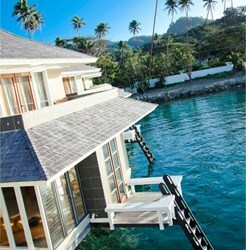 An easy climb down the ladder puts guests in the Azure waters of bewitching Koro Lagoon. Inside, the bures feature his and hers vanities, spacious bathrooms, and expansive king-sized beds, perfect for passion. And romantic seclusion is not all the New Edgewater Bures have to offer. They also offer the best value for those seeking an authentic, waterfront resort experience in incomparable Fiji. Koro Sun’s northern unspoiled location offers the genuine warmth and friendliness of the Fijian people, beautiful lush tropical surroundings, and warm, impossibly clear waters. The forty one private bures and villas at Koro Sun Resort feature spacious, individually appointed décor, and all are fully air-conditioned. Your stay defines the term “all-inclusive” – from airport transfers to bountiful gourmet fare, and a flurry of non-motorized water sport activities. Beverages are additional. For more information on Koro Sun Resort, visit our page on this lovely spot! Special note – Ask us how you can receive 50% off at Koro Sun Resort!